When it comes to summer and baking, I'm not a huge fan of spending much time in the kitchen. I mean in the UK this year we've had a heatwave. Literally a whole uninterrupted month of sunshine and hot weather. I had to make the most of it! But I do love to bake. And at this time of year there are so many fantastic summery recipes to make and enjoy. 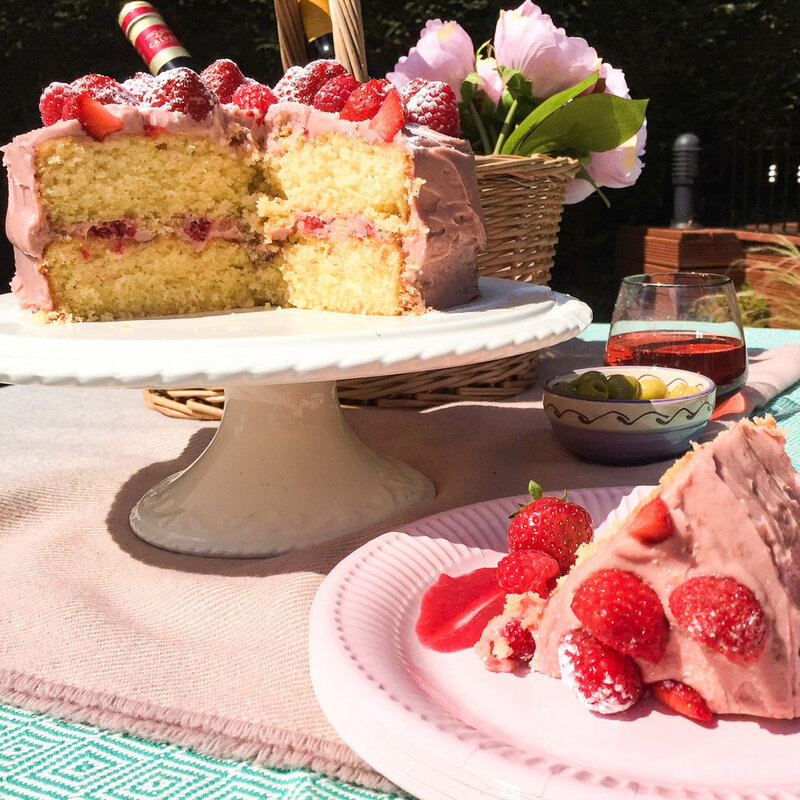 I've been making so many berry themed cakes and desserts that when the lovely folks at Marks and Spencer asked me to help promote their summer berries range I knew it was a bandwagon I wanted to jump right on. I buy most of my fruit from M&S anyway (most of my shopping if I'm honest), and love the fact that the company champions British berries. They have worked with some of their farmers for over 40 years, and the company are committed to the sustainable sourcing of British ingredients. I love knowing I'm supporting my local farmers! I decided to make an Elizabeth Sponge Cake (recipe below). It was the perfect cake for summer days - delicious, fresh, fruity and packed full of delicious raspberries and strawberries. it lasted an afternoon in my garden with friends and went down an absolute storm! Check out the recipe below - I hope you think it's as delicious as my family did! Preheat the oven to 180C. Grease and line 2x20cm cake tins. Use an electric mixer to beat the butter and sugar until very light and creamy. This should take a couple of minutes. Scrape down the sides, then add the beaten eggs a little at a time while still mixing. Scrape the sides of the bowl down again to make sure everything is incorporated. Fold this dry mixture into the wet mixture. Once combined add the lemon juice and zest. Fold until fully incorporated, then leave to rest for 10-15 minutes. Divide the mixture between two tins, smooth the tops and place in the oven. Bake for 25-30 minutes, or until golden brown and a skewer inserted into the centre comes out clean. Allow to cool in a tin for ten minutes, before transferring to a wire rack to cool completely. Using a food processor, whizz up the raspberries and icing sugar until smooth. Pass through a fine sieve. Weigh out 180g of coulis and set aside for the buttercream. In a small bowl, mix the egg yolks and sugar until well combined. Transfer into a saucepan over medium-low heat, and add the coulis a little at a time - stirring all the while with a wooden spoon. Once you have the required consistency, transfer to a large bowl to begin whisking the butter with an electric whisk. Add the cold butter cubes to the still-warm mix, a bit at a time, whisking all the while - until you have a light, smooth buttercream. Set aside until ready to use, but don't refrigerate yet. Once the sponge layers are completely cool, lay the first cake down on a tray or cake stand - even out the top with a knife. top evenly with a layer of buttercream, and a scattering of raspberries - halving them if they are large. Lay the second cake on top of the first, and use up the rest of the buttercream to frost the sides and the top. Use a palette knife for a smooth finish. Top with lots of strawberry slices, pointed side up, and the rest of the raspberries. Place in the fridge for 25-20 minutes to let the buttercream firm up slightly. Dust with icing, serve and enjoy! P.S. I had a little extra coulis left over, and I spooned a little on the side of each cake portion for an extra hit of raspberry!